George Town: Major shareholders of SP Setia Bhd, Malaysia's biggest developer, plan to buy a strategic stake in property and hospitality company Eastern and Oriental Bhd (E&O), people familiar with the matter said yesterday. 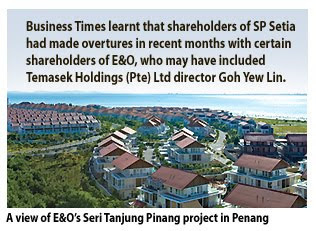 Business Times learnt that shareholders of SP Setia had made overtures in recent months with certain shareholders of E&O, who may have included Temasek Holdings (Pte) Ltd director Goh Yew Lin. SP Setia's three biggest shareholders currently are Permodalan Nasional Bhd with a 32.9 per cent stake, the Employees Provident Fund with a 14.47 per cent interest, and SP Setia president and chief operating officer Tan Sri Liew Kee Sin, with 11.96 per cent. As at July 30 2010, Singapore's G.K. Goh Holdings Ltd owned 13 per cent of E&O. E&O managing director Datuk Tham Ka Hon and spouse Datin Chua Cheng Boon collectively own about 17 per cent of the company. Liew did not confirm or deny if indeed SP Setia is interested in buying E&O. A company official from SP Setia. who did not want to be named, said SP Setia is always looking for new acquisitions including land deals and strategic stakes. "Some plans are remote and some more certain. We won't comment on speculations," he said. E&O deputy managing director Eric Chan, when contacted, said the management was not in any acquisition talks with any party. "We remain committed to our strategic gameplan to establish our position as a true luxury lifestyle property development group, which we will achieve via international and regional exposure of the E&O lifestyle brand. "This is through the establishment of strategic alliances with renowned international institutions and the development of new growth engines," Chan added.